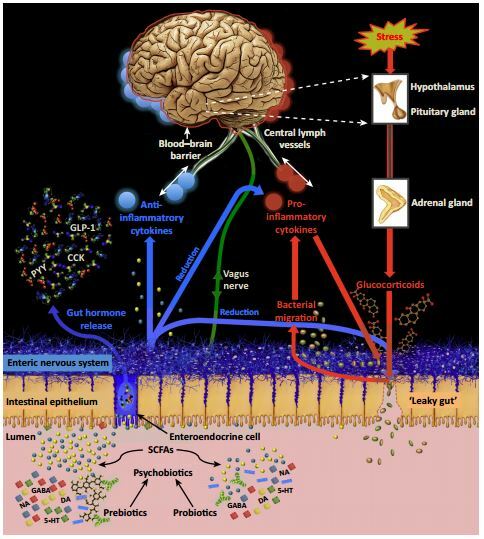 Sciblogs | Psychobiotics – bacteria as a psychiatric medicine? Psychobiotics – bacteria as a psychiatric medicine? A growing field of research – psychobiotics – hints that the millions of bacteria living inside us have more of a say in our mental well-being than we think. Since then there have already been leaps forward in our knowledge about the connection between the bugs in our gut and what is going on in our heads, says Dinan, a psychiatrist at the University of Cork, Ireland. This week, Dinan and an international team of researchers, writing in Trends in Neurosciences, detail the new frontiers of psychobiotics, charting the landscape of what we already know and posing the critical questions we need to answer to advance our understanding. Ted’s co-author, Philip Burnet, an associate professor of psychiatry at the University of Oxford, says that we already know that certain bacteria – particularly Lactobacilli species – can have profound effects on the behaviour of animals. In mice, enhanced immune function, better reactions to stress, and even learning and memory advantages have been attributed to adding the right strain of bacteria. Early studies in human have given some signals that certain types of gut bacteria can have an effect on the mind. These studies are more difficult to interpret because mood changes in response to probiotics are self-reported, but physiological changes, such as reduced stress hormone levels and inflammation, have been observed. How exactly do gut bacteria influence the nervous system? One of the key players the authors pinpoint is the vagus nerve, a bundle of neurons connecting the lining of the digestive tract to the brain. Changes in gut chemistry caused by bacteria are picked up by vagus nerve receptors in the gut, which can influence brain activity. In animal models, blocking vagus nerve activity limits some of the effects of psychobiotics, highlighting its critical role as link between the gut and the brain. Other possible mechanisms include shifts in the functioning of the immune system caused by bacteria and the release of peptides into the blood stream created by certain bacteria breaking down molecules in the gut. The diagram from Burnet and Dinan’s Trends in Neuroscience paper below highlights the complexity. Beyond that, it might not just be a case of getting the right bacteria, but also how we help to keep them healthy once inside us, Burnet says.. Here in New Zealand, researchers are keeping an eye on the developing field, and warn we has a long way to go before we can say with any certainty which bacteria truly have beneficial effects on mental health. Last year University of Canterbury’s Prof Julia Rucklidge and her student Amy Romijn conducted the first systematic review of human studies involving psychobiotics. “So what does this mean? Well – it’s like anything, the craze seems to come before the evidence. We need to be a little more cautious about believing that probiotics are going to help alleviate psychological symptoms. At this point in time we really don’t know and much more research is required to effectively provide advice to people considering this option for treatment. Having said that, people do get better on probiotics, they just don’t often get better than the placebo group. The question is whether that improvement can be entirely attributed to the placebo effect or not. I have a daughter who had behavioral changes, marked changes, when she had a strep throat. It happened repeatedly, to the point where her behavior told me she had strep throat instead of vice versa……and she would be tested and receive antibiotics. When she was 18 she was diagnosed with schizophrenia vs. bipolar disorder…..now only bipolar disorder. I ALWAYS felt it was related to those strep infractions. !!!!!! !